Our current President and his allies, with their domestic and foreign policies, judicial appointments, rhetoric, insults, and name-calling have set our country and the world on a very dangerous course. EarthAction has a key role to play in limiting the damage and getting the world back on track to a more just, sustainable, and peaceful world. That's why we need your support now, more than ever. 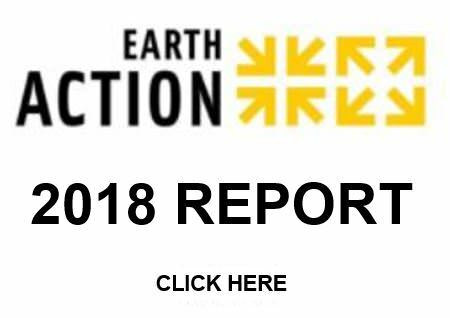 With your contributions over these last 26 years, EarthAction has made real progress in finding solutions to many of the world’s most pressing issues. Our work has helped to educate children around the world, provide health care to women, protect the lives of indigenous peoples and immigrants, stabilize our climate, and reduce the risk of chemical, biological and nuclear wars. As one of our generous friends, you have—and will continue to play—a critical role in changing our national and global political landscape forever. I urge you to make a donation that will enable us to continue and expand our work in 2019. There is so much more we can do, with your help. This is the time of year when many of us make our most meaningful donations to help change the world. I hope you’ll include EarthAction on your list of causes to support. Click here to contribute on our website, or send a check to EarthAction, PO Box 63, Amherst, MA 01004. Please make the most generous gift you can. 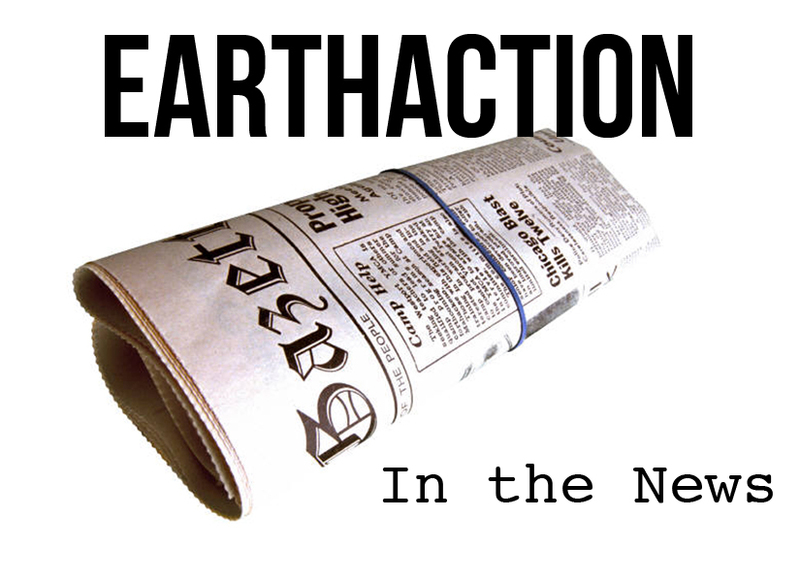 EarthAction remains unique in its ability to build global political will and create positive solutions on such a wide diversity of issues. Whenever there are opportunities to make change towards a world with more peace, justice, and environmental protection, we are at work making sure people understand the issues, appreciate what’s at stake, and know how to add their voice for change. Your support is what makes it possible. P.S. Can't help spilling the beans a little … as you'll read in our EarthAction 2018 Campaign Report, Best Climate Solutions has given its 2018 International Award to our Climate Scorecard Spotlight Project for our “effectiveness in Communicating Climate Change Threats and Opportunities.” I'm very proud and very grateful for your help to make this possible. This is one more example of what we're doing together for democracy, peace, and the environment. Your donation today will help us continue that critical work in 2019. Click here to donate. Many thanks. Last week (Oct 24-30) was UN Disarmament Week, when member states vote on a range of disarmament decisions and resolutions. Decisions are binding on the United Nations. Resolutions are indications of governments' positions and intent - they are not binding but can be very authoritative and influential if supported by key countries. The deliberations and votes took place in an environment of increasing tensions between nuclear-armed States, and also an increasing divide between non-nuclear countries and those countries which rely on nuclear weapons for their security. Will We See the Trial of the Century? The midterm election on Nov. 6 is one of the most important in memory. It will decide whether checks and balances will be restored to the federal government and especially to our out-of-control president. An even more important event is scheduled to take place nine days earlier, however. It could make history by ensuring that our children and future generations have a constitutional right to a livable world. On Oct. 29, the United States government is scheduled to go on trial for contributing to global climate change. The trial is the result of a lawsuit, Juliana v United States, filed three years ago by a group of 21 young adults and children. They allege that the federal government is violating their constitutional rights by promoting the use of fossil fuels. Fossil fuel pollution is the principal cause of global warming. The Julianas, as I’ll call the young plaintiffs for the sake of simplicity, want the courts to rule that the federal government must stop subsidizing fossil fuels, opening public lands to fuel production, and doing other things that result in carbon pollution. They want the government to rapidly phase out carbon dioxide (CO2) emissions from fossil fuel combustion and to develop a national plan to stabilize the climate system and “restore Earth’s energy balance”. Finally proceeding to trial would obviously be a big milestone in the Julianas’ long fight through the federal court system. It is not motivated by partisanship. It was filed when Barack Obama was president and it named his as well as many federal agencies as defendants. Now, the Trump Administration is on trial and the U.S. Department of Justice has been fighting furiously to keep the case from being tried. Justice Department lawyers have filed motion after motion to have the case dismissed, including legal maneuvers one judge called “rare as hen’s teeth”. But so far, the legitimacy of the case has been upheld repeatedly by a U.S. District Court, a Circuit Court of Appeals, a three-judge panel and even the U.S. Supreme Court. As I write this, the Supreme Court is deciding yet another late motion by the Justice Department to keep the trial from happening. On May 24, United Nations Secretary-General Antóio Guterres will release Securing our Common Future: An Agenda for Disarmament, a new initiative to address the humanitarian impact of armed conflict and the increased threats from arms races, international tensions and proliferation of weapons of mass destruction. The UNSG will release the agenda at a special event at the University of Geneva which will be live-streamed, making it possible to watch the UNSG's presentation and follow-up discussion on your smartphone, laptop or computer. May 24 is also the Women's International Day for Peace and Disarmament. Parliamentarians for Nuclear Nonproliferation and Disarmament (PNND) are using the occasion to release Common security for a sustainable and nuclear-weapon-free world, a joint parliamentary statement commemorating the day and supporting the UNSG's initiative. The joint parliamentary statement also highlights the 17th anniversary birthday of Bertha von Suttner, the author of Lay Down Your Arms and the first woman to receive the Nobel Peace Prize. PNND and UNFOLD ZERO actively promoted former UNSG Ban Ki-moon's Five-Point Proposal for Nuclear Disarmament which was supported worldwide and was influential in advancing a framework for a nuclear-weapon-free world. It is hoped that the new initiative of Antóio Guterres will be even more influential in moving the international community to step back from militarism and war, and to replace this with more comprehensive use of law, diplomacy and common security. Philippine President seeks to have 600 Indigenous leaders "tagged" as terrorists! Emergency Response Needed! The human rights situation in the Philippines is deteriorating with the widespread cases of extrajudicial killings and ongoing attacks against voices critical to the government. A petition was recently filed in court by the Philippine State Prosecutor of the Department of Justice (DOJ), that seeks to have a number of indigenous peoples' leaders and human rights defenders declared as terrorists and outlaws pursuant to the National Security Act of 2007. An estimate of around ten (10) indigenous peoples' leaders and human right advocates from Mindanao are also included in this list. ORGANIZATIONS: Add your name to a letter to President Duterte (see below). Email your organization's name and country to: communications@indigenouspeoples-sdg.org and to robie@indigenouspeoples-sdg.org. The deadline for endorsements is MARCH 18, 2018. INDIVIDUALS: Sign on to this letter at Change.Org using this link: 1. H.E. Rodrigo Duterte President of the Republic Malacañang Palace, JP Laurel St., San Miguel : STOP THE HARASSMENT & INTIMIDATION OF INDIGENOUS PEOPLES' LEADERS / HUMAN RIGHTS DEFENDERS. EVERYONE: Send letters of concern to the Philippine Embassies in your respective countries and the government officials listed in the letter of concern below. 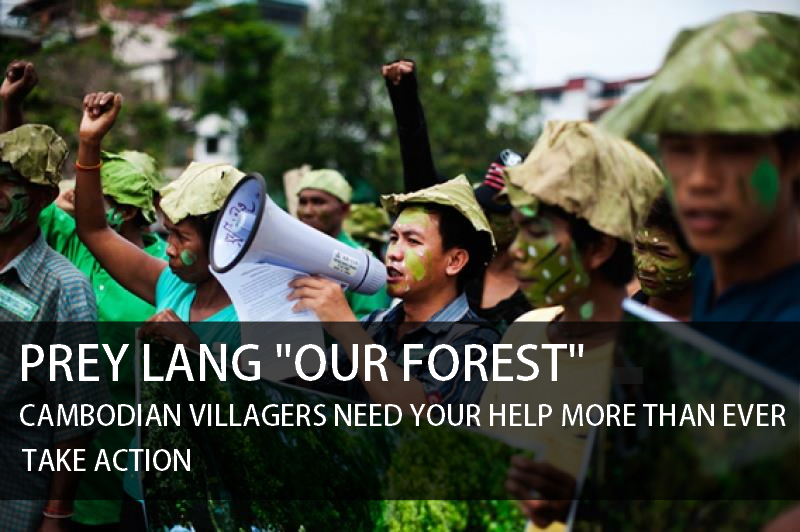 Kindly inform the Indigenous group <communications@indigenouspeoples-sdg.org> of any actions you have undertaken so they can share this as part of their campaign. Why the Haitians Should Stay: These longstanding residents are valuable assets to the U.S. The Trump Administration announced last month that it will rescind the visas of almost 59,000 Haitians who are legally documented under the Temporary Protected Status (TPS) program. The visas were granted after an 8.0 earthquake in 2010 demolished the Caribbean country. The migrants have until July 2019 to leave unless they can qualify for another visa status. The decision is no surprise given Donald Trump's views on immigration, and it's false advertising to call a program "temporary" and never end it. Yet if the Administration and Congress are putting America first, they ought to let these productive people stay in the U.S. The TPS program began in 1990 to help undocumented foreign nationals who would face unsafe conditions upon return home due to natural disasters, armed conflict or other extraordinary conditions. It is available for individuals living in the U.S. before the event occurs. It doesn't open the U.S. to a flood of migrants after a crisis. Honduras, Nicaragua, El Salvador, Syria, Somalia, Sudan and South Sudan also have TPS designation. Last month the administration announced that Nicaragua's TPS protection - granted in January 1999 after Hurrican Mitch - will end in January 2019.It covers migrants who have been here almost two decades and number around 5,300.TPS for Salvadorans, which began in March 2001 and has been extended through March 2018, covers 262,000 migrants. For 58,500 Hondurans protection has been extended to July 2018. Many of these immigrants are likely to stay in the U.S. illegally. The Haitian difference is that it's far from clear that the country has recovered from the earthquake or recurring outbreaks of cholera brought to the country by a U.N. peacekeeping unit in 2010. In 2016 Hurrican Matthew (Category 4) set the country back again. With almost a decade of legality under their belts, the Haitian migrants have put down roots in the U.S. Returninglikely would plunge them into poverty. Given that choice they are more likely to revert to living in the shadows as they did before the earthquake. That won't be good for tax collections or national security, which benefits from knowing the U.S. population. Haitian global remittances amount to some 25% of Haiti's annual GDP and about half of that money comes from the U.S., according to the World Bank. This is the best kind of foreign aid because it doesn't go through the hands of corrupt politicians. It boosts economic stability, strengthens civil society and reduces the risk of refugee crises. Yet retaining the TPS migrants is not about charity. Although the 676,000 Haitians living in the U.S. make up less than 2% of the foreign born population, they are an important part of the services workforce, especially in tourism and healthcare. As the general manager of the InterContinental Miami - where about a dozen Haitians with TPS visas work - told The Wall Street Journal: "It's going to be difficult to replace all of those positions in the short term. The labor force in South Florida is already pretty tight." The U.S> educational investment in thousands of Haitian children over almost a decade also would be lost if families are returned. Sometimes it's easy to identify the end of a crisis and halt TPS protection, as with the 2014 Ebola outbreak in Liberia, Guinea and Sierra Leone. But more often with recurring catastrophes, national recovery can take years. Mr. Trump has discretion over when to end the program for any one country. Alternatively, Congress could alter the 1990 statute so that proven contributors to the U.S. economy would receive special consideration to stay permanently. Both decisions depend on whether these immigrants are viewed as assets or liabilities for America. We think they're assets.